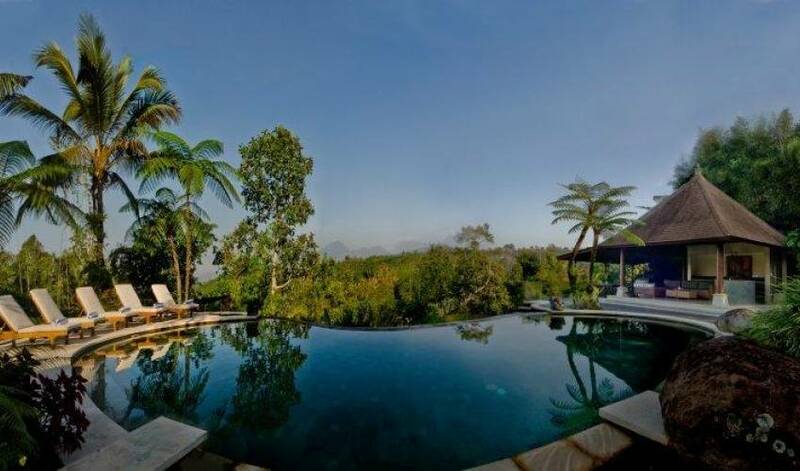 This stunning Villa is perfectly suited for those who demand the fineries of a 5 star luxury hotel but desire the privacy and exclusivity offered by a villa rental. 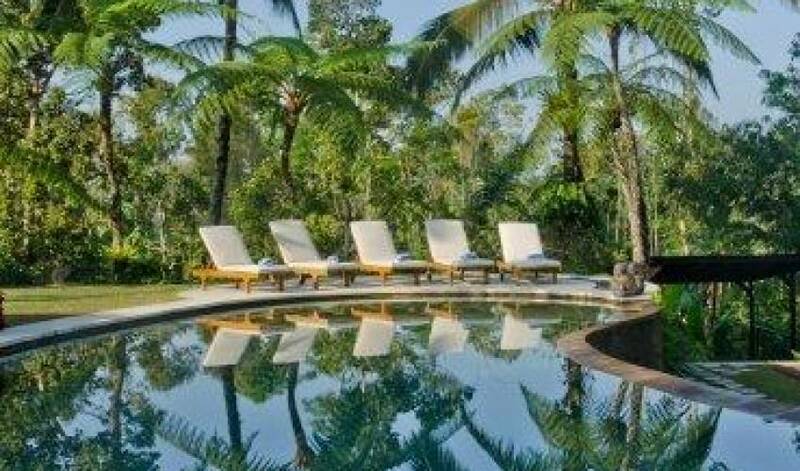 Located 20 KM from Ubud in the heart of Bali, the location is splendid for those seeking stunning views and a natural environment enjoyed in a luxurious ambience. 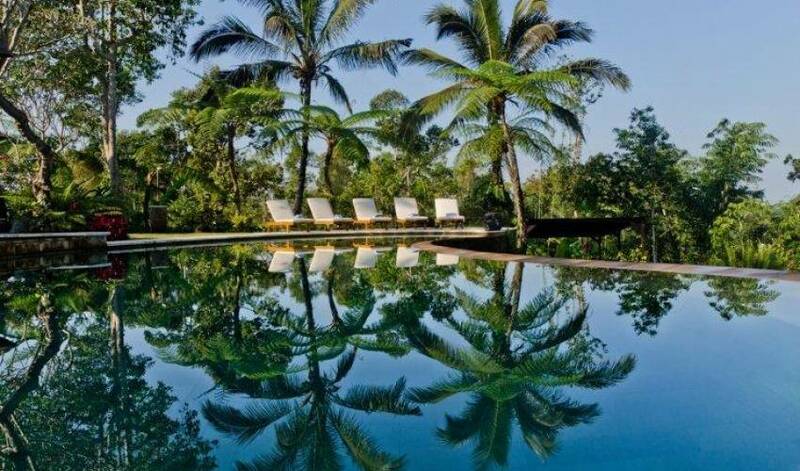 The Villa has an in house manager who ensures that high standards of personal service are maintained. 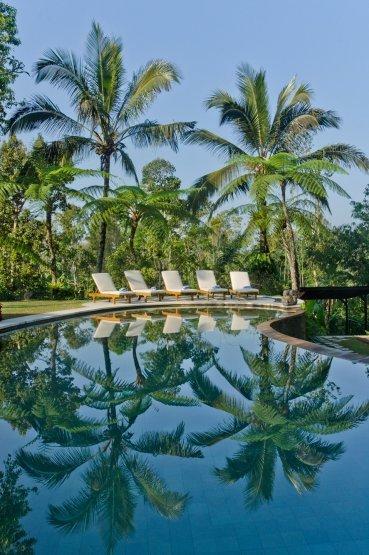 The in house manager makes Villa ideally suited for those accustomed a high level of personalized service and a hassle free vacation experience resulting from a knowledgeable and caring team of Villa staff. 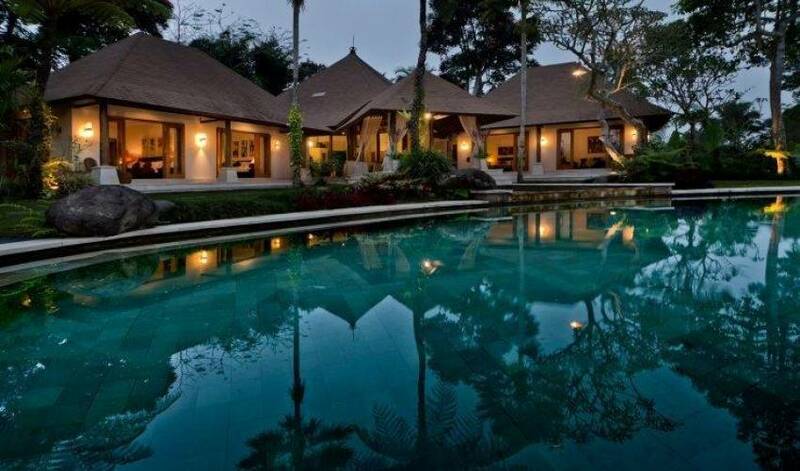 The property is a thoughtfully designed luxury villa with great attention to detail. 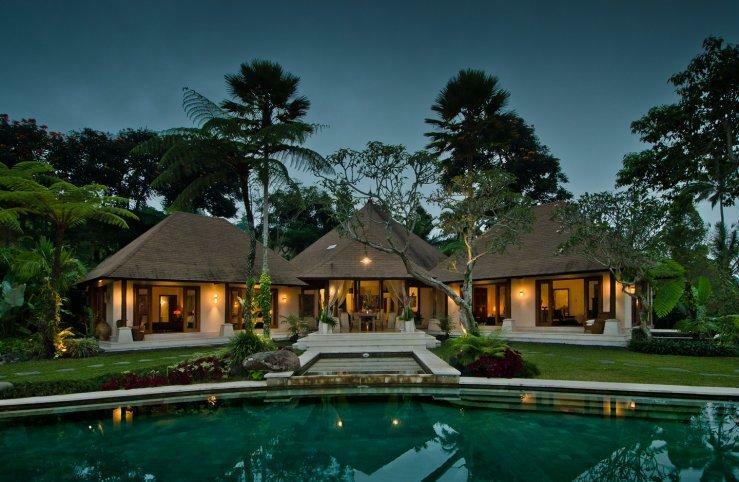 It was built, landscaped, decorated and furnished to exacting demands with the goal of satisfying well traveled visitors who demand the best of Bali accommodations. The properties open plan living room and kitchen are octagonal shaped and open to the splendid views of the Ayung River Valley. The Living Room and Kitchen are open on the valley side and were designed to capture the amazing surroundings. The ceiling height is 9 Meters (30 Feet) and the floor space of the Living Room and Kitchen measures 120 Sq. Meters (1,300 Sq. Feet). Well equipped for cooking & entertaining. The Master Bedroom is beautifully decorated with high quality furnishings, original artwork, Turkish area rugs and many objects d’art. The floors are cream marble, the décor is polished and the housekeeping is impeccable. You will be very comfortable staying in the Master Bedroom. And yes, breakfast can be served in your room. Bedroom # 2 measures 25 Sq. Meters (260 Sq. Feet). It is beautifully decorated with original Balinese artwork, a 17th Century Chinese cabinet, objects d’art and a Turkish area rug rounding out the décor. As throughout the villa, the floors are cream marble. The waterfall and fish pond are beautiful and make this bathroom a stand out feature of Bedroom # 2. Bedroom # 3 measures 25 Sq. Meters (260 Sq. Feet). It is decorated with modern Balinese artwork, a 17th Century Chinese cabinet, an antique Burmese Buddha, objects d’art and a Turkish area rug rounding out the décor. As throughout the Villa, the floors are cream marble. 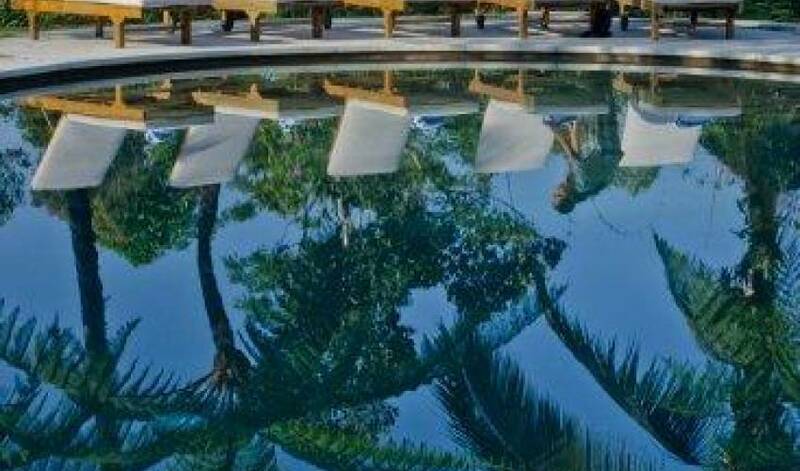 1 King or 2 Double Beds (to be requested at time of booking) Well Appointed Décor and Lighting. The Owner’s Suite is a 95 Sq. Meter (1,050 Sq. Feet) private villa. 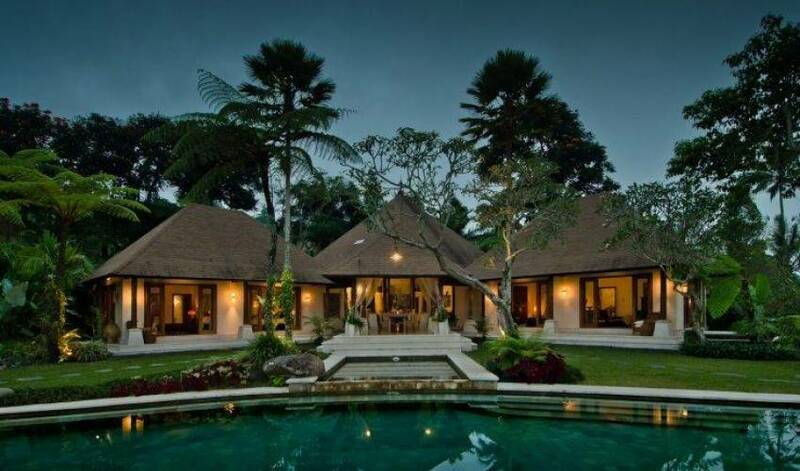 It is luxurious, lavish and modern. 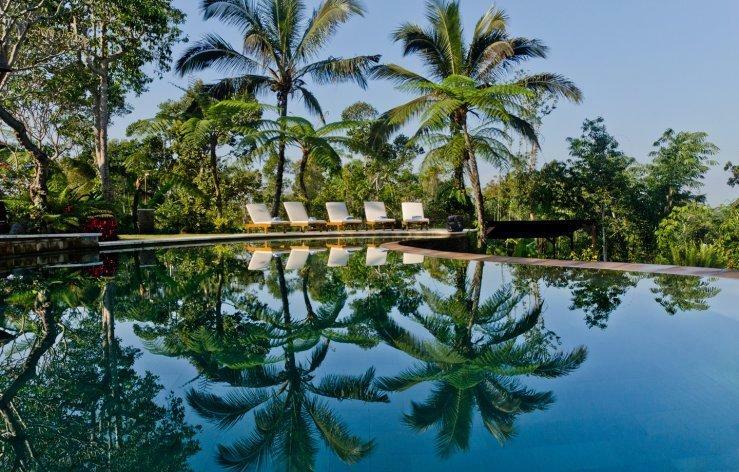 Your stay in the Owner’s Suite will be supremely comfortable and private.The Owner’s Suite is physically separated from the Villa being located at the front of the property’s grounds on a landscaped island. 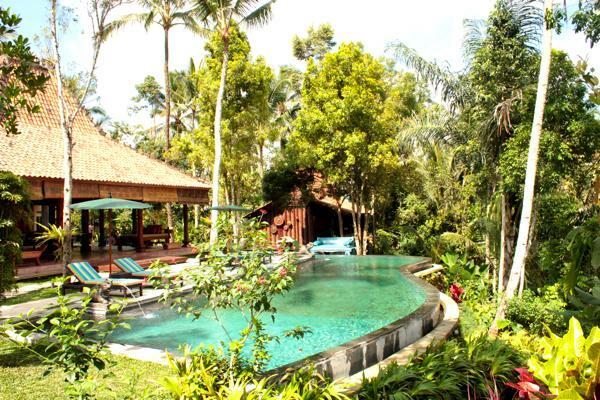 Dense tropical vegetation and a Lily pond with waterfall visually and physically separate the Owner’s Suite from Villa. The Owner’s Suite is very private and although close to the main entrance of the main Villa it feels quite removed from the main villa assuring your privacy. 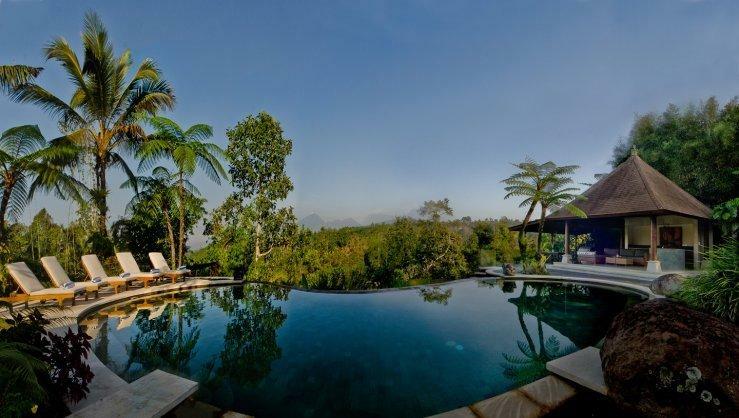 While the main villa offers an Ayung River Valley view, the Owner’s Suite has a rice field view from the study and a view of the Lily pond and waterfall from the living room. 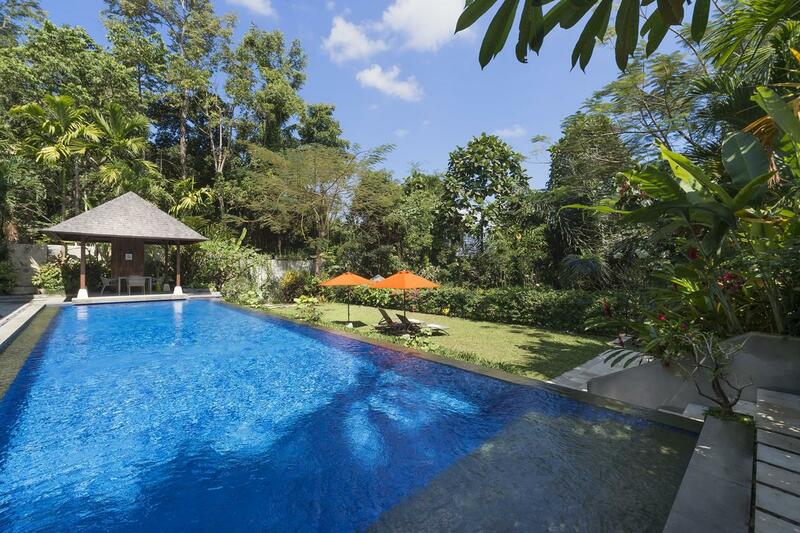 The Owner’s Suite is ideally suited for two couples who wish to rent the Villa together. 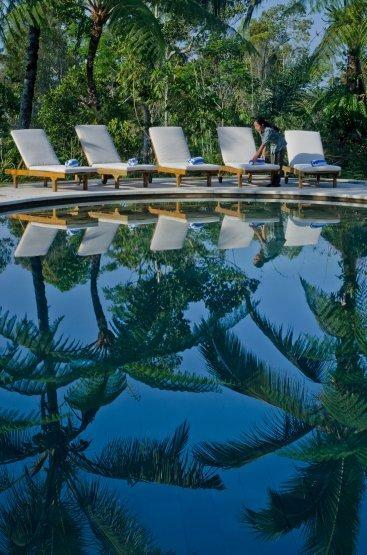 Both couples can enjoy the common areas of the main villa whilst the Owner’s Suite is separated from the main house allowing both couples a high degree of privacy when desired. The Master Bedroom and the Owner’s Suite are both luxuriously sumptuous accommodations sure to satisfy the most demanding types. Occupying the Owner’s Suite and Master Bedroom allow two couples to share the Villa yet at the same time insures a high degree of privacy for both parties. 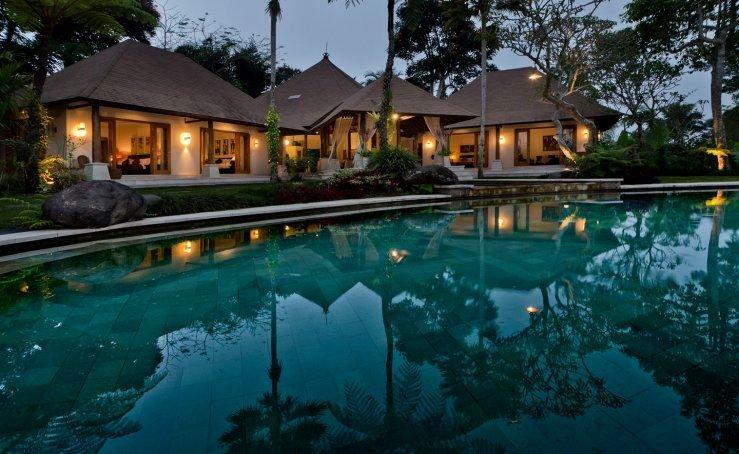 Bedrooms # 2 and # 3 of the villa are ideally suited for occupancy when a group of friends wish to share the villa. Both the Master Bedroom and the Owner’s Suite are practically self contained apartments. Both are luxuriously appointed, supremely comfortable and sure to satisfy the most discerning guests. 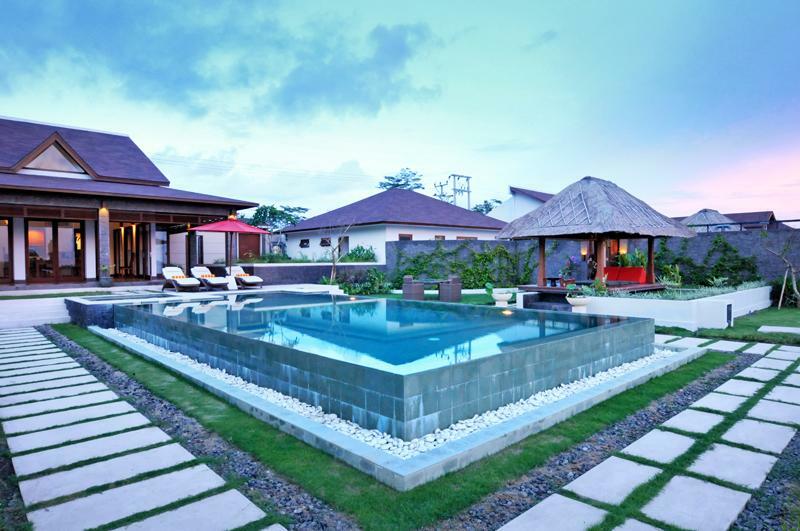 The Owner’s Suite is modeled after the villas at one of Bali’s finest 5 Star hotels – right down to the last architectural detail.